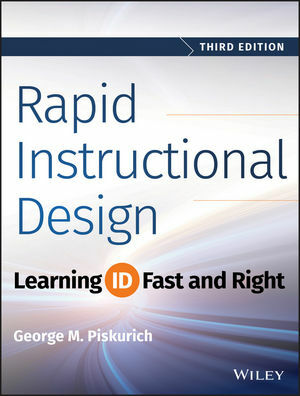 Rapid Instructional Design is the industry standard guide to creating effective instructional materials, providing no-nonsense practicality rather than theory-driven text. Beginning with a look at what "instructional design" really means, readers are guided step-by-step through the ADDIE model to explore techniques for analysis, design, development, intervention, and evaluation. This new third edition has been updated to cover new applications, technologies, and concepts, and includes many new templates, real-life examples, and additional instructor materials. Instruction delivery has expanded rapidly in the nine years since the second edition's publication, and this update covers all the major advances in the field. The major instructional models are expanded to apply to e-learning, MOOCs, mobile learning, and social network-based learning. Informal learning and communities of practice are examined, as well. Instructional design is the systematic process by which instructional materials are designed, developed, and delivered. Designers must determine the learner's current state and needs, define the end goals of the instruction, and create an intervention to assist in the transition. This book is a complete guide to the process, helping readers design efficient, effective materials. This book does exactly what a well-designed course should do, providing relevant guidance for anyone who wants to know how to apply good instructional design. Eminently practical and fully up-to-date, Rapid Instructional Design is the one-stop guide to more effective instruction. GEORGE M. PISKURICH is an organizational learning and performance consultant specializing in e-learning interventions, performance analysis, and telecommuting. He is an active member of both ISPI and ASTD, with over twenty-five years of experience in learning technology facilitation and design for both multi-national corporations and smaller organizations. George also teaches at John Carroll University, N.C. State, Georgia State, and Mercer University, and resides in El Paso, TX.